Engine mount trolling motors offer great space-saving benefits but are also a bit more confusing that traditional bow mount motors. In this guide, we'll discuss how to pick the right sized motor, ensure it's compatible and install it to your outboard motor. Minn Kota engine mount trolling motors vary only by thrust, so you don't need to worry about selecting from different feature sets or series. The only real decision you'll need to make is how powerful of a motor you want / need. Minn Kota's engine mount models come in 55, 80, 101 and 160 lbs models. 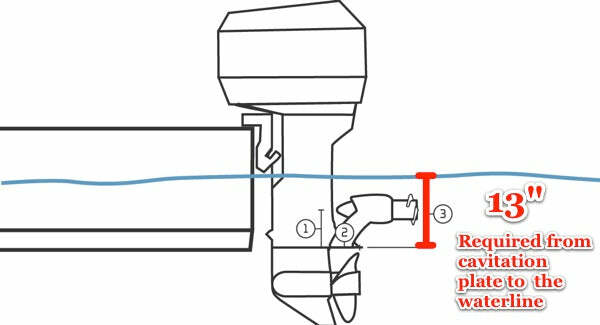 Like all trolling motors, you boat's weight should be the primary factor you consider when selecting motor thrust. If you're unsure of your boats' weight, we recommend referring to the NADA boat directory which lists boat weights for thousands of different makes and models. When calculating a weight, make sure to include the weight of fuel, passangers, and additional gear. 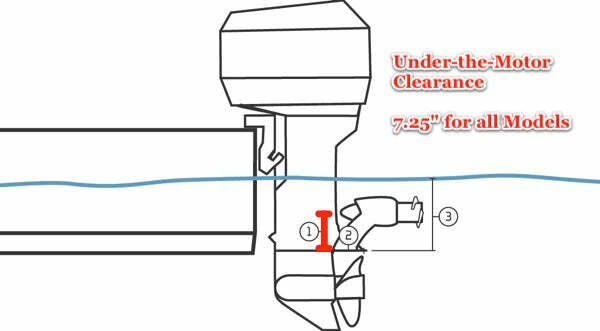 For an engine mount motor to work properly, the outboard's cavitation plate needs to be at least 13" below the waterline. This ensures that the motor will be submerged deep enough to prevent trolling motor cavitation, which can lead to reduced power and increased fish-spooking noise. 13" is the MINIMUM: 13" is the minimum distance required for your motor to function well. If the distance is even an inch less - at 12" - there's a good chance you'll run into performance problems. Measure UN-TABBED: When measuring, make sure your outboard is NOT tabbed (ie - it's sitting straight down in the water). You'll use your the trolling motor with the outboard in the non-trimmed position, so that's where you should measure it from. After confirming ample cavitation submersion, you'll want to make sure your cavitation plate ledge is long enough to mount the motor on. Just about all cavitation plates should have enough length to support a motor, but it's always good to check. 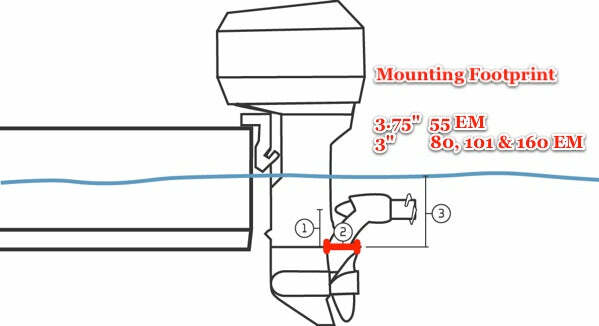 You'll want to measure and make sure that the cavitation plate has a 3" to 3.75" long ribbon (depending on the model of motor you'll be using - see chart below) on each side of the outboard spine where you can mount the motor. 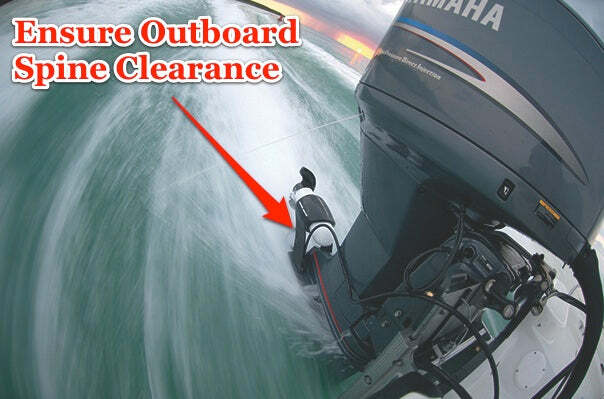 Again, this shouldn't be a problem with most outboards and should be found on just about all models. The last compatibility step is to ensure that the spine of the motor - the portion that sticks up in the middle of the cavitation plate - won't cause interference when the trolling motor is mounted. Engine mount motors are designed with a large gap in the middle to accommodate this spine, but you'll want to ensure ample clearance. To do so, first find the rear mounting location by measuring back 3" or 3".75 inches (depending on the motor - see section #2 above) from the front of the cavitation plate. Then, measure straight up 7.25". As long as your 7.25" measurement clears the motor spine, you shouldn't have any problems. For a better more visual representation, please see the two illustrations below. Position the engine mount motor on the outboard anti-cavitation plate. Try to position it as close to the outboard as possible, sliding it back if necessary. The mounting bracket / legs for the engine mount motor may need to be flexed moderately in order to accomodate the outboard motor's spine. Route the cable through the cable hooks and into the boat. Make sure to leave enough slack in the cable to allow for raising and lowering of the primary outboard engine.